I am 66 going on 90. ;) I pastor First Church of God in Waco, Texas. I'm just starting woodworking. I have been battling liver cancer for about two years and I was going down hill physically and emotionally. Then my wife bought me a compound miter saw and said, "Stop talking about woodworking and start doing it!" I have, and what a great blessing it has been. I'm doing so much better, physically, emotionally and to me most importantly, spiritually. The Old Testament prophet Nehemiah said, "Do not sorrow, for the joy of the Lord is your strength.” Woodworking has been used by God to give me back the joy of life which is my strength! That joy comes from the presence of Jesus with me as I make saw dust and learn new things. He seems to enjoy it since He and His earthly father were both carpenters. I can actually feel Him there with me guiding my hands and NOTHING could bring me more joy. Woodworking For Therapy #24: THINGS UNDONE? 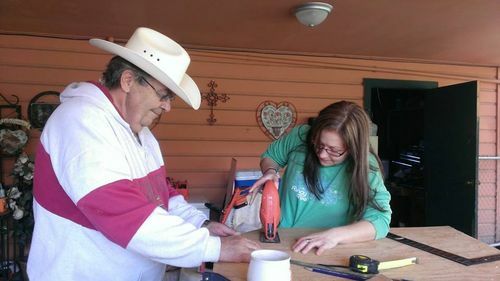 Woodworking For Therapy #23: Woodworkers Fighting Cancer - Yes, You Can Help! Thanks Jim. Looking forward to learning a new hobby and staying busy. QUESTION? Anyone know where I can get some rubber matting to put in front of my workbench? My ankles are killing me from the past two days of standing on concrete! Something a couple of inches thick and semi hard but with some rebound to it. I need one about 24”x50” and another to carry into the patio for jobs like the door I’m working on here with my daughter. The open door behind us is going to be my new shop. I found the mat I wanted at Tractor Supply. 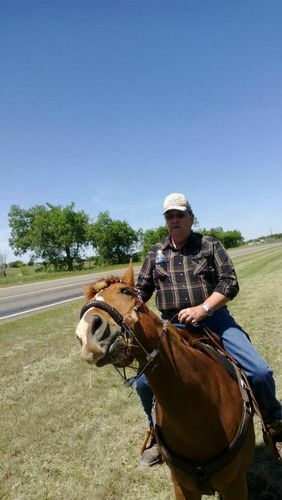 If it’s good enough for my horse, it’s good enough for me. Take care my new buddy, have a great New Year’s celebration. 2014 will be a better for you. I hope you whip the cancer so you can enjoy your new hobby. You have some mighty fine projects there Steve. I look forward to more of them. Work/Play safe. Keep makin dust. I do wish you the best.